The H–R diagram plots stars by their spectral class, colour, or effective surface temperature (horizontally) and their absolute magnitude or luminosity (vertically). The diagram not only revealed some intriguing patterns, but hinted at a theory about the life story of stars. It remains an important teaching and visualisation tool to this day. This version of the H–R diagram is from Richard Powell at the Atlas of the Universe. It plots data on a set of 23,000 stars. All the relevant files are available at Modeling Commons, with a video of the wolf, goat & cabbage solution at Vimeo. 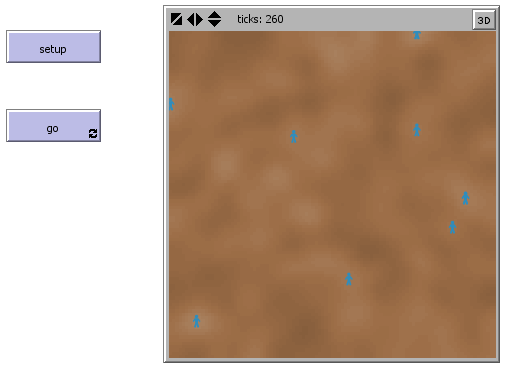 Update 2: I have added a further two-part tutorial revisiting the famous “Artificial Anasazi” model, simulating farmers 1,000 years ago, in what is now Arizona. 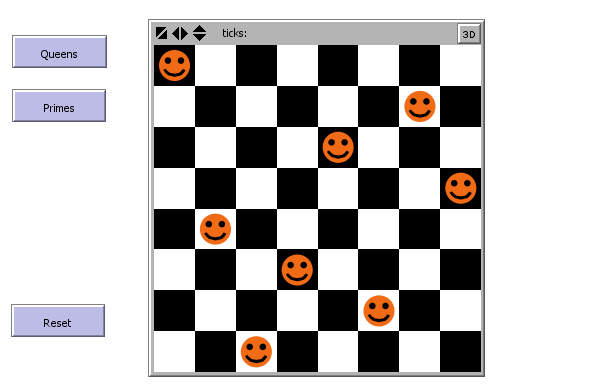 Update 3: I have added a brief tutorial on theorem-proving using sequent calculus. Joseph Banks was the botanist who accompanied Captain Cook on his 1768–1771 voyage to Australia and the South Pacific. The genus Banksia is named in his honour – the Banksia integrifolia above is one example of the genus, and is taken from Banks’ botanical work, the Florilegium, which is partially available online at the Natural History Museum in London. The artwork in this book is largely thanks to Sydney Parkinson, the artist who accompanied Banks (his self-portrait is below). Working under difficult conditions, Parkinson produced 943 botanical drawings (including 269 finished watercolours), but died of fever on the voyage back from Australia (he was only 25). A number of artists in England completed what this young hero of botany had begun, allowing the rest of the world to experience some of Australia’s unique and bizarre flora. Thank you, Sydney. Here is an interesting educational use of LEGO® which I have not seen before – molecular models (full details in the PDF file here). See also this post by “supercatfish” for a slightly more complex example, involving burning propane (which I discussed in my kitchen chemistry post series). In my Goals in NetLogo tutorial and the Wolf, Goat, and Cabbage follow-up, I discussed the use in NetLogo of lists of agent goals. We will now see how a simple planner can be used to generate such goal lists. For the planner, we represent possible system states (not including the boat being in transit) with a list of the form [ w g c m ], where the items are 1 if loose on the right bank, -1 if loose on the left bank, and 0 if being carried by the man. The initial state is therefore [ 0 0 0 1 ]. A wrapper function calls this planning function with the initial state, and adds some goals to tell the wolf and goat to stop eating after the final solution has been obtained (this ensures termination, with all goals being satisfied). The final program is available at Modeling Commons. See also here for a video. 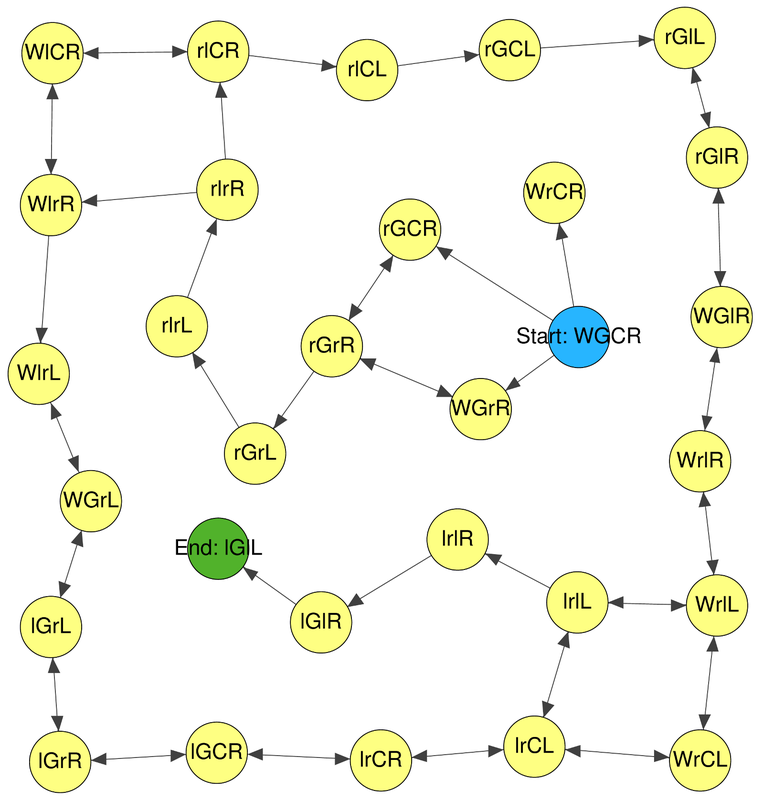 The diagram below shows the system states explored by the planner, starting at the blue state and ending at the green one (the final “L” or “R” in state names marks the position of the man, lowercase “l” or “r” marks the position of loose items, and uppercase “W,” “G,” or “C” marks carried items). For more complex planning activities, it may be appropriate to interface NetLogo to external Java-based planning software, such as JavaFF. These molecules vibrate in place, and as the temperature increases, they vibrate faster (indeed, that’s what temperature means). In most solids (“dry ice” is an exception), there comes a point where the molecules break loose from the solid structure (though still being held down by gravity) – this is called melting, and produces a liquid. As the temperature increases even further, the molecules vibrate even faster. Eventually, gravity no longer holds them down, and they fly around in all directions – this is called boiling, and produces a gas. The chart shows some exceptions, however. 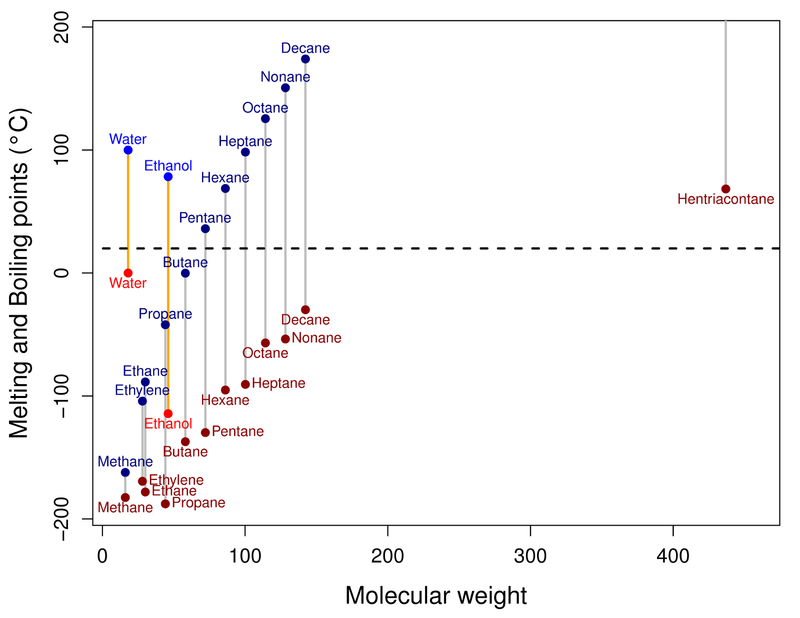 Water molecules and ethanol (alcohol) molecules are very light, but they tend to “stick” to each other, and this means that water and ethanol are liquids at room temperature. In water, for example, the oxygen atom (red in the model below) carries a slight negative electrical charge, while the hydrogen atoms (white below) carry a slight positive electrical charge. Because of the same phenomenon that allows static electricity on a recently used comb to attract small scraps of paper, the oxygen atom on one water molecule is attracted to the hydrogen atoms on other water molecules. This “stickiness” means that it takes more heat to make the water molecules fly away. Armed with a good thermometer, the home experimenter can verify that water boils at 100 °C (place the thermometer in a saucepan of boiling water) and freezes at 0 °C (place the thermometer in a cup of water which is in turn placed in a bucket of salt and crushed ice, and see at what temperature the water starts to freeze – the same method can be used to find the freezing point of different kinds of oil, and even to make home-made ice cream). Alternatively, put the thermometer in a cup of ice, and see at what temperature the ice starts to melt. 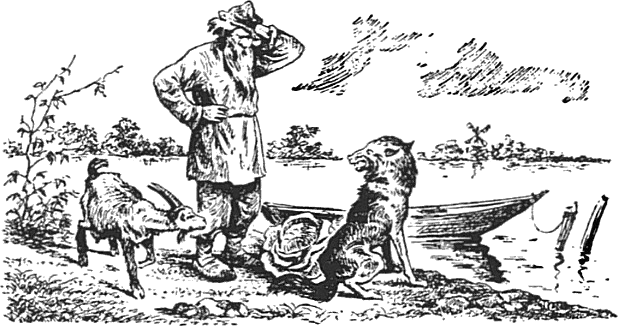 The puzzle of the wolf, goat, and cabbage is an ancient one – it appears in the Propositiones ad acuendos iuvenes, attributed to Alcuin of York, and written around 800 AD. The NetLogo solution described here builds on a modified version of my Goals in NetLogo tutorial. The goto goal here is the same as for the previous tutorial, and the meet goal differs only in containing a reference to an agent, rather than a string identifier. The wait goal contains a reporter task, and succeeds when that task returns “true.” The instruct goal gives aditional goals to another agent or (with an empty list) erases another agent’s goals. The pickup and drop goals set the carrier variable of another agent to mark it as being carried. Agents being carried always follow the agent carrying them. The embark and disembark goals are used by the man to be carried by the boat. Domain-specific goals include eat, satisfied by the wolf and goat if they succeed in devouring their favourite food, together with go-left and go-right, the first of which expands to the goal list ["meet" boat "embark" "instruct" boat ["goto" (1 - bank) 0] "wait" (task at-left) "disembark" "goto" (- (bank + 3)) 0)], and the second of which expands to something similar. Note the use of task to create a reporter task from the reporter at-left. Initialisation code is as follows, with the entire program available at Modeling Commons. See also here for a video. For agents to develop the solution on their own, a planner is still needed. ask man [ set shape "person"
set goal (list "drop" wolf "drop" cabbage "go-left" "drop" goat "go-right" "pickup" wolf "go-left"
"pickup" goat "drop" wolf "go-right" "pickup" cabbage "drop" goat "go-left"
ask cabbage [ set shape "plant"
ask goat [ set shape "cow"
ask wolf [ set shape "wolf"